Costly Japanese domestic phone prices are looking to take a tumble with low-priced hybrid fixed-line/IP telephony services. The newest team-up pairs Japan’s Fusion Communications with Skype Technologies. Fusion’s patent-pending gateway technology takes incoming number-based calls and works with Skype’s database to route them to Skype IP telephony subscribers using the 050- prefix, similar to NTT Communications’ Click-2-Connect IP phone service, also using the 050 designation. Skype works with Windows, Mac OS X, Linux and PDAs using Pocket PC. Users typically connect through their PC. Is Skype, the no-cost free Net telephony provider, finally going to turn a profit? Luxembourg-based Skype is no newcomer to this market — they have an ongoing partnership with Internet provider Livedoor — but their current VoIP protocols exclude fixed-line numbers from incoming calls. Using the company’s SkypeOut plan, subscribers can call out to landlines and mobile numbers, but others cannot call in as easily. This system should help overcome that barrier and broaden Skype access, particularly for business users who could receive calls on their PC no matter where they are in the country. 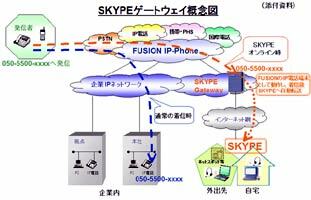 Fusion announced its own package of IP services on 13 May, with the Skype announcement (in Japanese) following on 6 June. Though the Skype/Fusion prices have yet to be released, costs for the Fusion IP Telephony package are set at 8 yen for three minutes from fixed lines and around 16 yen/minute via mobile phones (2 yen cheaper than NTT’s rate); international calls run at 8 yen/minute. The Fusion IP monthly service fee will be 3,360 yen (Skype prices should be comparable). Like its NTT Com counterpart, the service will undoubtedly launch to business users first with a modified consumer package to follow later. Skype has found some very powerful playmates in this partnership. Fusion’s major shareholder is Powercom with a controlling interest of 54.7 percent. Powercom brings to the table a 250,000-kilometer fiber-optic network and broadband services. Now follow the paper trail from Powercom and it leads to the Tokyo Electric Power Company (TEPCO) – from whom all our Tokyo electricity blessings flow – which holds 81 percent of Powercom. TEPCO’s HIKARI Network Company provides FTTH (Fiber to the Home) over fiber optic networks and facilities. TEPCO has been very interested in expanding into all areas of communications and Skype allows them to jump into VoIP just as NTT Comm is working so hard to push awareness of IP service to corporations. IP telephony use is up 57.2 percent according to a new report from Japan’s Ministry of Internal Affairs and Communications. The Ministry found that for fiscal 2004 ending in March of this year, IP telephony had a total of 8.3 million subscribers. The addition of 050-, fixed-line and mobile access could transform Skype from a handy but relatively niche desktop PC IP telephony service into a more mainstream telecom provider.